On the French side of Saint Martin in the Baie Nettle (Nettle Bay) neighborhood, several scenic restaurants line the water’s edge. Tucked amongst the palm trees is Layla’s, serving fresh seafood and colombo, a Caribbean curry dish by way of Sri Lanka. Originally, the Sri Lankans, who were taken to the French West Indies to work on the sugar plantations, brought curry powder with them. Here in the Caribbean islands, colombo is essentially a thick curry stew, typically made with chicken. At Layla’s they serve both a chicken and goat version. The entrance to Layla’s is not immediately visible from the street, but the bright, friendly sign cannot be missed. We parked our car in the gravel parking lot and made our way through the palm trees before coming upon the entrance to the restaurant. We were first greeted by the bar and the welcoming staff at Layla’s. If you are really cool you can arrive by boat and moor at their small dock and enter the restaurant directly from the beach. Picnic tables and patio furniture are scattered throughout the sandy beach under the shady cover of the palm trees. We took our seat at the water’s edge with a cool breeze coming off the bay and a view of the city of Marigot in the distance. Layla’s specializes in French Creole and seafood cuisine, and you’ll also find typical beachfront options, like burgers and grilled fish, as well as fresh made salads. 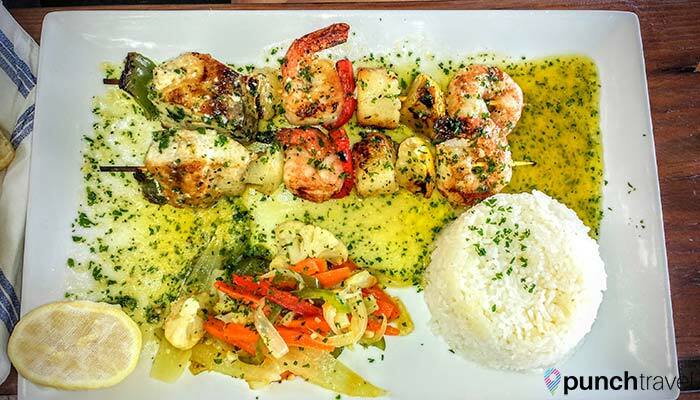 There are also several daily specials, like this seafood brochette we had on the day we visited. However if you do find yourself at Layla’s, don’t miss their homemade colombo. Had I been feeling more courageous that day (and also not in the midst of strep throat), I would have gone for the goat colombo, but I decided to play it safe with the chicken colombo. When the dish arrived, I was not disappointed. On my plate were three generous portions of chicken, slow-cooked to tender perfection and drenched in the colombo curry sauce. 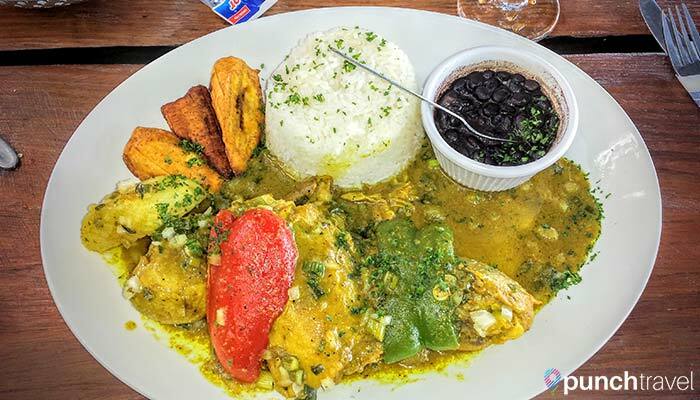 Accompanying the chicken were roasted peppers and potatoes, fried sweet plantains, rice and beans. The colombo was rich and hearty, with just the right amount of kick. The chicken was juicy and easily fell off the bone. It was classic Caribbean comfort food at its best and the bold flavors stood out despite my muted sense of taste from being sick. If seafood is more your game, you can’t go wrong with the seared ahi tuna. 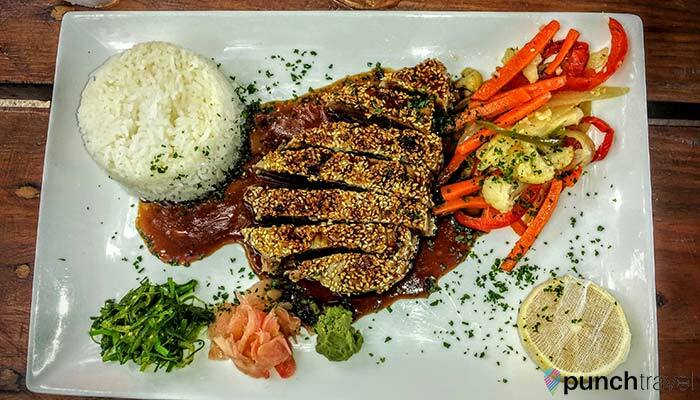 Lightly seared and covered in sesame seeds, the generous portion of tuna is served with teriyaki sauce, rice and salad. Even though we were stuffed from our entrees, we decided to splurge for dessert. 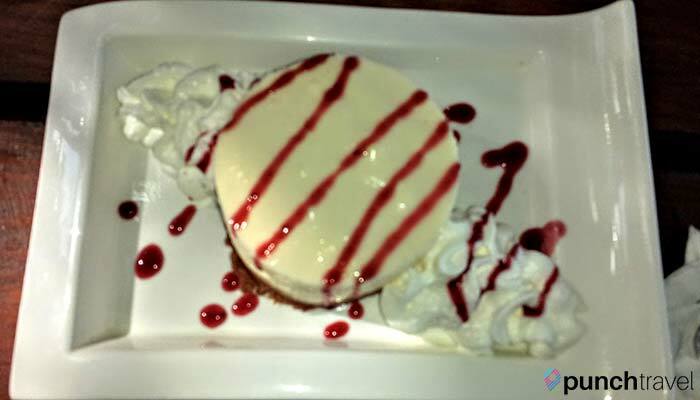 Though nothing can ever beat the strawberry cheesecake I get from Settepani in Brooklyn we opted to try Layla’s cheesecake based on a recommendation from the waitress. Well, it wasn’t really cheesecake. It was more like a panna cotta on top of a graham cracker crust, but it was light and fluffy and sat better in my stomach than a traditional cheesecake would have after the large meal we just had. After lunch, we needed to burn off some of those calories so we took a turn in the playground onsite. Layla’s has a pretty decent play area for kids, including a jungle gym, swings, slides, and a wading pool. 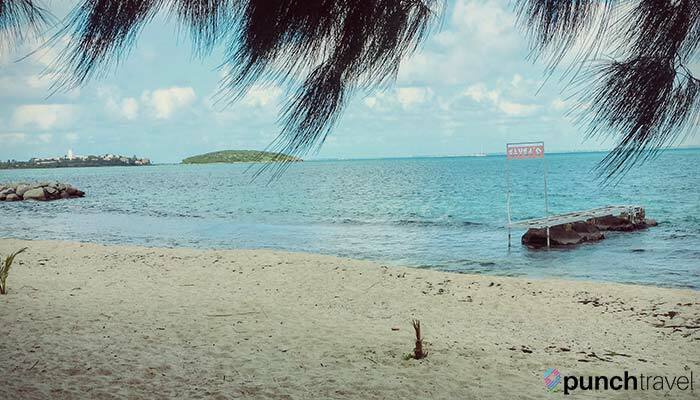 It is easy to lose track of time here, with plenty of activities to entertain the kids, a beautiful beachfront and a variety of drinks and filling nourishment on the menu. Layla’s is located in Baie Nettle, French Saint Martin and is open for lunch and dinner.